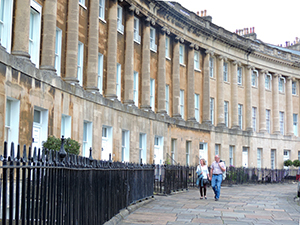 Although Bath isn’t far from London – It’s only 1½ hours by train from Paddington Station – when you walk about the city you’ll feel as though you’ve traveled back to another century. The question, though, is which century? While this beautiful city is renowned for its spectacular Roman baths, it’s also renowned for its 18th-century Georgian architecture. It’s this pleasant mash-up of history and architecture that’s earned the city its UNESCO World Heritage status. 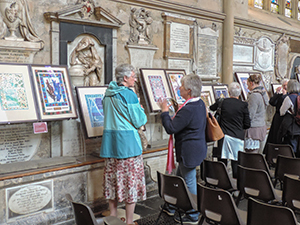 It’s also made Bath a popular day- and a long-weekend trip from London, which only contributes to the city’s onerous parking problems. Luckily, though, once you’ve dumped the car you’ll find it’s an easy city to walk about. As do most people, after I dropped my bags at my hotel I headed right into the heart of town, which surrounds Bath Abbey and the old Roman Baths. According to legend, the father of Shakespeare’s King Lear is said to have discovered the natural hot springs in 860 BC and founded the city on the spot. Centuries later invading Romans built a temple on the spot, dedicated it to the goddess Minerva, and launched spa tourism. 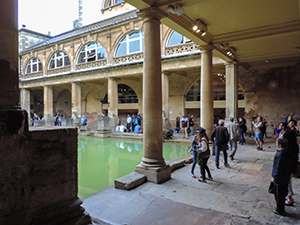 A tour of the baths is quite interesting and, if nothing else, will leave you with respect for Roman engineering. After the fall of the Roman Empire, the springs continued to be used for their curative powers, including by medieval monks who exploited them to travelers. But it wasn’t until the visit to them by Queen and in 1702 that they came back into vogue. Bath Abbey, built in 1499, overlooks the Baths and rises above a courtyard filled with tourists, buskers and a multitude of shops. The beautiful interior is well worth a visit; the façade outside has stone Angels climbing to heaven on Jacobs Ladder. Adjacent to the Baths are the famous Pump Rooms, a beautiful old tearoom that was the hub of 18th-century spa society. Pause for a snack, cup of tea or flute of Champagne. As did the Georgians who drank the spa waters as a cure for a multitude of ailments, you can also have a sip of it from the fountain here although it is an acquired taste. While the old Roman baths remain an interesting historic site, the opening of the Thermae Bath Spa in 2006, has once again made Bath a spa destination. It’s just a short walk away and offers a wide range of spa treatments, with it’s open-air rooftop pool contributing greatly to its popularity. Whether or not you’re interested in Georgian architecture you should see (or, perhaps, “can’t help but see”) the Royal Crescent, often called the most majestic street in Britain. It’s a magnificent piece of architecture, a semicircle of three-story buildings overlooking the city and all of the greenery about it. 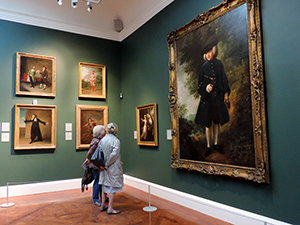 Don’t miss visiting Number One Royal Crescent, a very interesting home-museum that provides a glimpse into what aristocratic life was like in the 18th century. 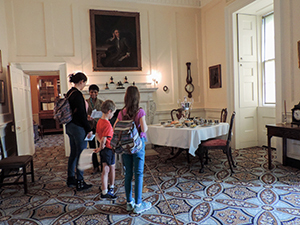 It’s fascinating and well furnished, and the docents in each room are quite knowledgeable. Be sure to look at the sheets that are available, which give you an overview of each room and other miscellaneous things of the period. The gift shop is also interesting. From the Royal Crescent walk up Brock Street to the Circus, a Colosseum-like circle of homes (the 18th-century painter Thomas Gainsborough lived in #17). The circle is comprised of 33 homes divided into three equal sections with a small park with a large stand of trees in its center. 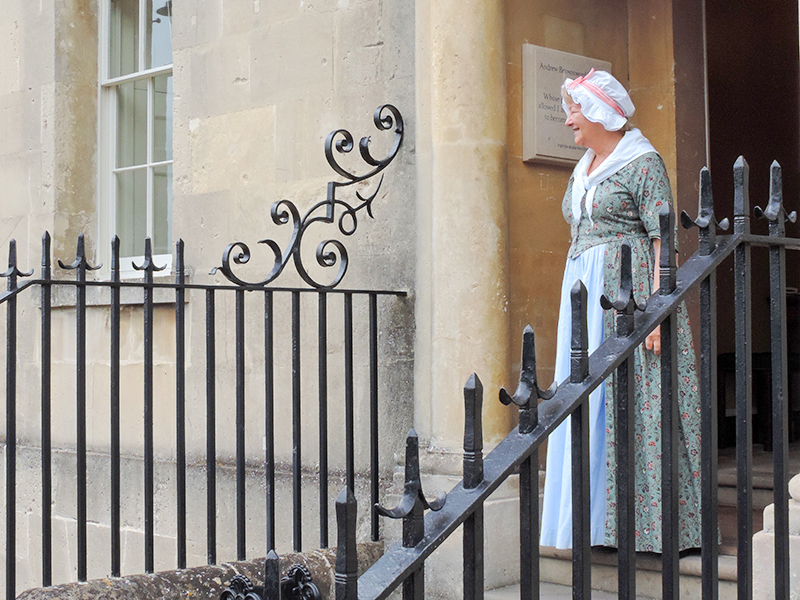 Even if you’re not an Austin fan, it’s a fairly good and interesting little museum, not only providing a fair amount of information about Austen but also about the times in which she lived. 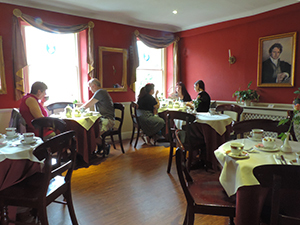 And the Centre’s Regency Tea Room tempts many with Mrs. Bennet’s Lemon Drizzle Cake. If nothing else, take a selfie with the Greeter in his top hat out in front. Head for the beautiful Pulteney Bridge, which like the Ponte Vecchio in Florence and the Ponte di Rialto in Venice, is lined with shops. Before you cross the bridge, however, on your right you’ll see Grand Parade and the Parade Gardens, a beautiful little park where in the 18th century courting couples came for secret liaisons. 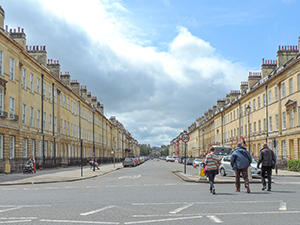 Head across it and walk up Great Pulteney Street, a wide street lined with more beautiful Georgian-era homes and in approximately 10 minutes you’ll come to the Holburne Museum. The small Holburne is quite interesting despite its size and provides a nice museum experience if you’re on a rushed one or two-day schedule in Bath. Its collection includes works by Gainsborough, Reynolds, and Stubbs, as well as pieces of Wedgewood, some bronzes and early period furniture. There’s a modern extension to the beautiful, old museum building, which encompasses a garden café that serves seasonal lunches. In the warm weather you can lunch out on the lawn. If you want to see something interesting, when you’re leaving the Holburne ask for directions to the narrowboats off Bathwick Hill Road. Narrowboats are “narrow boats” on which some people live, and others use for holidays touring about England and Wales. If you’ve never seen them before here’s your chance to see them up close, and perhaps speak with some of their owners. You’ll find an entrance down to the towpath from the street next to the bridge on Bathwick Hill Road right past the Tesco Express supermarket. 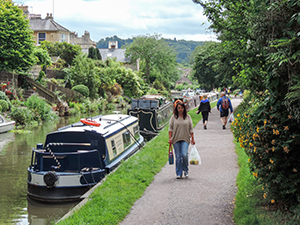 The walkway along the towpath is part of Britain’s National Waterway Walk. 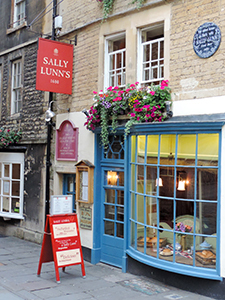 Back near Grand Parade, tucked away at #4 North Parade Passage, is Sally Lunn’s, home of the original “Sally Lunn’s Bun,” still served here and made from the original recipe. Sally was a young French refugee who sold buns, similar to the sweet French brioche bread, from her house (circa 1482) that is now a small historic restaurant and Museum. Excavations beneath the house show that the site has been used since Roman times. The restaurant is open from morning to night, with dinners served in a candlelit atmosphere. For some it can be the perfect ending for the day.